I'm going to call this summer "the summer of contentment". Banished was the run down, over-scheduled version of myself instead I opted for a deliberate, quiet, and content with the moment summer. I took back my free moments and put them to better use. I methodically went through a small mountain of belongings without a home, rearranged furniture, and took carefully inventory of what was necessary and what wasn't. I have to say a clearing out of the environment is equivalent to the clearing out of the mind, or at least it is to me anyways. I really scratch my head and wonder sometimes how I made it all these years living with HDD. On most things I'd say we are polar opposites. I thrive in an "everything in its place" environment devoid of attachment to belongings, whereas HDD lives in a constant state of "what if I need that", unable to part with anything because it has some sort of memory or future use. For myself I believe the memories live upstairs and while having a memento of someone may bring them into my consciousness for a brief moment, I think of them regardless. I think the only way we survive such differences by knowing each other's strengths and weakness. In the long scope of things, I opt for letting go. This summer I moved on from so many things that I felt were holding me back in invisible ways. I even felt content to move on from this space I have shared with you for the last four years. Yet I kind of missed everyone, maybe it's those memories living in my head, still sorting out that one. In a large bowl mix together coconut oil, brown sugar, granulated sugar, eggs, milk, flour, baking powder, baking soda, salt, and almond extract and mix until combined. Line a 12-cup muffin tin with muffin wrappers and place about 2 tablespoons batter in each cup. Add a heaping tablespoon of jam on top of the batter in each cup and cover the jam with the remaining batter equally. Bake in 350 degree F oven for 18-20 minutes. Let cool. 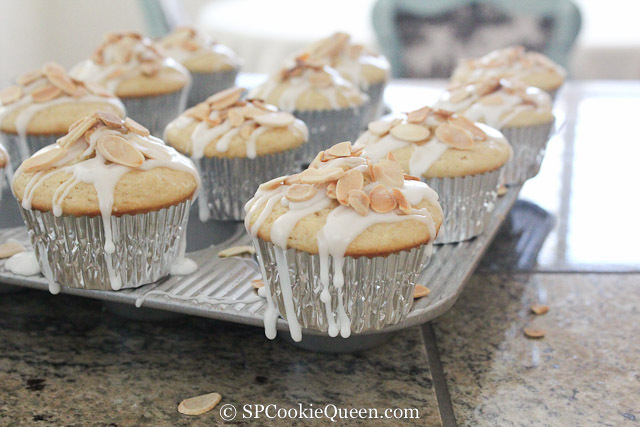 Combine in a small bowl powdered sugar, almond extract, salt, and milk and drizzle over the cooled muffins. Sprinkle the toasted nuts over the tops. What do you all think; is it better to be content or malcontent? After all, if one was completely content one would never go back and have a second muffin, would they now. I love this, Gina! I'm not very neat or organized. I keep the "public" areas neat, but it's anything goes in my little office. And opening closet doors and drawers is downright scary. I need to bite the bullet and clear out some things. Your post is inspirational! Plus, your cupcakes look divine! Happy September! Thanks Kath. Happy September to you. It's a daily struggle and I think we all have to put ourselves in the right mind frame to do anything. Gosh, your HDD behaves just like my husband who used to collect hundreds of cables in two large plastic boxes under his desk...just because he MIGHT need to use one of them..well, now most of them are in cellar. Have a relaxing and lovely day, Gina! I'm externally quite organised but my mind is usually an utter mess so I can still relate! So glad you had a restful and de-cluttering summer! These muffins look scrumptious, I adore the jam filling! It sounds like your summer was just what you needed. A time to reflect, re-energize. I used to be a organized person...but since having a baby I've let some things go. I need to find time to refocus myself! These muffins look delicious. Thank you for sharing them!